We would be honored if you would join us... for dinner! Darth Vader never quite got around to finishing his sentence in Star Wars: Episode V - The Empire Strikes Back, but he was really just inviting the folks to sit down for a tasty meal, and this Star Wars Join Us for Dinner by Dave Nestler Paper Giclee Art Print commemorates that scene. 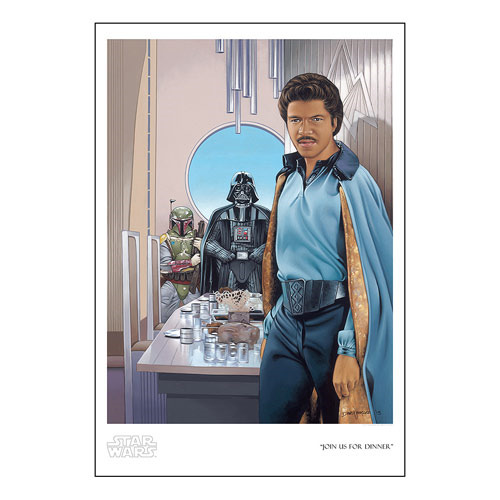 This beautiful giclee features Lando Calrissian on Cloud City opening the door to the dining room to reveal Darth Vader and Boba Fett, ready to take the gang prisoner. Printed on paper, this giclee measures 20-inches tall x 16-inches wide and is a limited edition of 150 hand-numbered pieces, complete with certificate of authenticity.